I mentioned my prayer for World Aids Day earlier. I spent most of my day in the office on hold today. I had calls to insurance companies and to the IRS. I was disconnected three times and had important phone calls come in while on hold during two other occasions. It wasn't until 1:30 that I got out of my chair to go grab lunch. As I sat eating my lunch at my desk, I scrolled through today's news. I learned that more people died of AIDs between 1980 and 1995 than the number of American troops killed in Vietnam. I read a compilation of stories from people who survived the epidemic while their friends passed away. I cried a lot. I realized that lesbian woman were much less at risk and were some of the first and only one's to help take care of gay men who were passing away because their families were ashamed and scared. Entire neighborhoods were wiped out. The government's response was to mock people and to provide little assistance. They called it the gay cancer even though people of all races and sexuality were getting it. Little research was done and fear spread. People died...lots of people. I got back to work with a heavy heart. I worked on holiday themed things and stuff that didn't require much thinking. 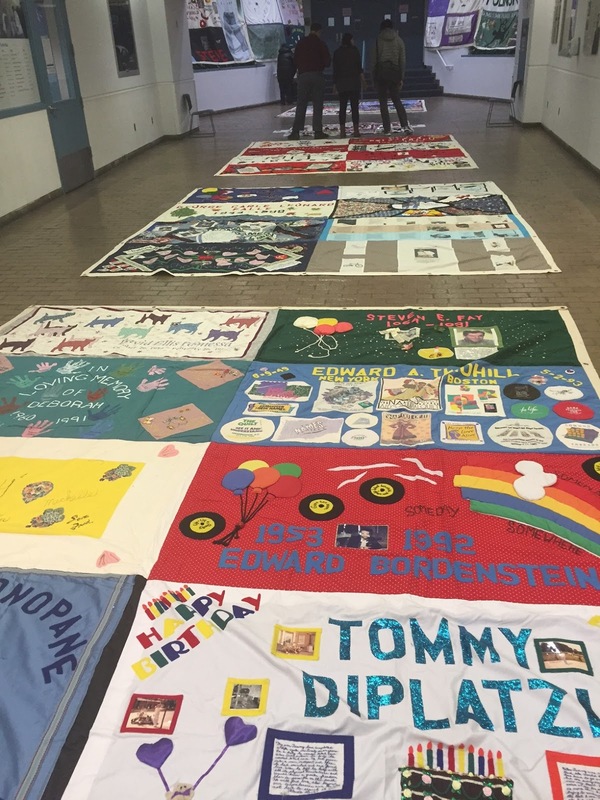 Then my assistant reminded me that there were panels from the AIDs quilt in our lobby. 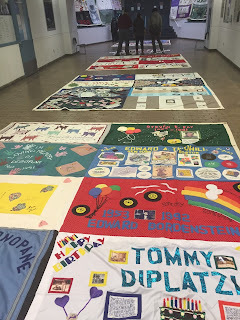 Did I know anything about the AIDs quilt? Yes, I helped bring some of the first traveling panels to Hartwick back in 1996. That was the first time I associated AIDs with people's faces and names. I remember being touched by the quilt then. I read the panels made by friends and family members. I giggled at some of the photos of the people who passed because of their outrageous and unapologetic clothing and was a bit ashamed. I wasn't quite my own self yet. I hadn't decided what a man I would be. Today, I went with my assistant to look at the panels here. I explained to her what each panel meant. I read the names, saw the photos, and I cried some more. I didn't break down sobbing, but was close. Similar photos and panels now only represent men and women who I knew wanted to be themselves. I was proud of the fact that they dressed, did their hair, and sang however and what ever they wanted. They were truly themselves. I feel like at 38, I am myself too, now. I love bow ties and bright colors. I like cuff links and fun hats. I like trying new things with my hair. I have sequins and satin and plenty of costumes to wear to parties. I love being me. Sadly, this made me cry more. To have such vibrant lives cut short hurts. There were panels of women too. I wondered what their story was. I will continue to cry until we find a cure for AIDs or a full prevention of HIV seroconversion. I will cry for future people infected and affected around the world. I will cry for those people who didn't get to live a long life being truly themselves. My life is beautiful because of you Mein Helfer.Lord jesus into my life as a candlelight in the dark. You showed me the meaning of faith with your words. I know even when i cried all day thinking how to get well you weren’t sleeping you were dear for me.I contacted Dr Itua herbal center lived in west Africa. A friend of mine here in Hamburg she’s from Africa too,She told me about Africa herbs but was nervous about it.I’m really scared when it come to African because i heard allot of fiend things about them due to my christianity I pray to god for direction,I takeathe bold step and contact him on email then move to whatsapp he ask if I can come oAver for the treatment or want a delivery,I said i want to meet him I buy 2ways ticke down to Africa to meet Dr Itua,I went there and i was speechless Of people I saw there.Patent,Sick people.Dr Itua is a god sent to the world,I told my Pastor about what am into,Pastor Bill Scheer We have a wonderfully Real Battle With Spirit And Flesh.worship that same night,He pray for me and ask me to lead,I spent 2weeks and 2days in Africa in Dr Itua Herbal Home,After the treatment He ask me to meet his nurse for hiv test when i did it was negative,I quitely ask my friend to take me to other nearby hospital when i got there it’s was negative.I was overwhelm with the result,But happy inside me.We went to Dr Itua,I thank him but I explain to him I don’t have enough to show my aprecaition he understand my situation but promise him to testify the good work of his.I thank god for my dear friend,Emma I know she might be reading this right now,I want to say thank you.And a big thanks to Dr Itua Herbal Center.He Gave me his calendar which I place on my wall in my house.Dr Itua Can As Well Cure The Following Desease…Cancer,Hiv,Herpes, Hepatitis B,Liver Inflammatory,Diabetis,You can contact him on email or whatsapp,@..drituaherbalcenter@gmail.com,phone number..+2348149277967..He’s nice Doc,Talk to him nicely.I’m sure he will listen to you as well.